It’s hard to believe this is the 100th issue of this e-newsletter, which was initiated in spring of 2013. During this past two-year-plus period, a few weeks were missed due to out-of-town trips. The format has evolved along the way, including this issue, which has been simplified into four sections: Views, News, Action-Solutions, and Events-Information. Also, future commentaries may well focus on selected articles that stimulate my thinking and provide inspiration to continue spreading the word about creating greater resilience and sustainability. I cannot overly recommend John Michael Greer’s blog postings, including this week’s posting (see Views). His knowledge of history and keen insights into the human condition are truly remarkable, especially his understanding of how humans need to relate more to the natural world, rather than remain so deeply adapted to artificial human environments. He especially feels that large, crowded metropolitan areas tend to isolate people from the rest of nature. I agree (see photo of two cities above). In like spirit, The Aspen Ideas Festival presentation by M. Sanjayan on MPR explains how nature can save us (see Views). Kurt Cobb’s article (see Views)—“Energy, The Repressed: Paging Dr. Freud”—addresses the techno-advanced “no-work future” technocrats have been promising for decades. Cobb poses the question: Where will the requisite energy come from to power all the predicted marvels that are supposed to further reduce work and create more leisure? Never mind that this elitist strategy hasn’t worked very well previously, and continues to reduce employment for increasing numbers of people. Even worse, many citizens work more but earn less, while those enjoying more leisure time tend to be unemployed. The media has been abuzz over the illegal trophy killing of Cecil the lion, and Jason Bradley addresses the venomous outpouring of negative comments on social media. His main concern is the deluge of indignant feelings expressed about the death of an increasingly rare wild animal, especially when so many black persons and unborn babies are also being murdered. Jason provides a poignant, rational response that seems to make some sense of this issue. > The Archdruid Report: The Cimmerian Hypothesis, Part Three: The End Of The Dream (John Michael Greer). It’s precisely because civilizations free themselves from the corrective feedback of nature, and divert an ever-larger portion of their inhabitants’ brainpower from the uses for which human brains were originally adapted by evolution, that they generate such torrents of creativity. Equally, it’s precisely because they do these things that civilizations run off the rails into self-feeding delusion, lose the capacity to learn the lessons of failure or even notice that failure is taking place, and are destroyed by threats they’ve lost the capacity to notice, let alone overcome. > Resource Insights: Energy, The Repressed: Paging Dr. Freud (Kurt Cobb). A recent article (“A World Without Work”) in The Atlantic Monthly provides a clever and rather more subtle discussion of the post-work world than I’ve seen elsewhere, but the word “energy” appears exactly zero times. It is assumed that humans will somehow extract enough energy to run all the new machines that will serve (or run?) us. It is assumed that climate change will not be so disruptive as to make our current technical civilization crumble or at least falter significantly. In short, the future is just the past with a lot more energy-guzzling gadgets and apparently a lot more playtime. > Jason Bradley: I’m Sorry. I’m Really Doing My Best to Care about Everything. We have to stop being condescending when a story flares up and everyone’s talking about it for a moment [Ex: Hunter killing Cecil, the lion]. When you post your update about how ridiculous it is that we’re all talking about this low-priority problem, you’re contributing to the noise. Most of the problems we’re dealing with are symptoms of the same illness — privileged people feeling like they have the right to exploit others and do whatever they can afford to get away with. This means we’ll abuse minorities, the unborn, and nature if it suits us, and it’s got to be revealed for what it is. I promise not to stop caring, but I beg you to let others express their grief in their own way. > MPR: Aspen Ideas Festival: ‘How Nature Can Save Us’ (54-minute talk). M. Sanjayan is senior scientist at Conservation International and host of the acclaimed PBS series, “Earth: A New Wild.” Sanjayan says preserving natural resources like forests and oceans can help the humans just as much as the other animals. 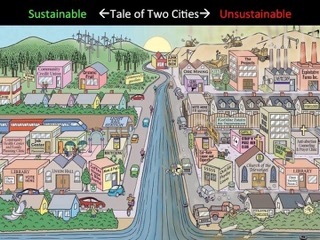 > Yale Environment 360: Resilience: A New Conservation Strategy For A Warming World (Jim Robbins). Resilience calculations are going on all over the conservation landscape these days. Around the globe, species are on the move, rising up in elevation at a rate of 11 meters and pole-ward at 17 kilometers per decade — about 36 feet and 10 miles respectively — to escape the heat and stay within their niches. That’s more than two or three times as fast as previous accounts. Conservation, then, is a moving target and growing more that way, in ways both predictable and not. > Ensia: 8 Charts And Maps Show Why Drought Will Be A Growing Challenge In The U.S. A report from The Hamilton Project released in late 2014 examines the history of drought across the U.S. and the economics of water in the country. > Climate Progress: More Than 180 Evangelical Leaders Endorse Obama’s Carbon Reduction Plan (On July 30th, theologically conservative faith leaders sent a letter to President Obama endorsing the Environmental Protection Agency’s (EPA) proposed Clean Power Plan (CPP), a sweeping, historic project unveiled in June and set to be officially released next week. Signers of the letter, which was posted on the Evangelical Environmental Network’s website, framed their support in explicitly moral terms. Signatories included pastors, teachers, and evangelical thinkers. > Post Carbon Institute: Shale Gas Reality Check (David Hughes). America’s energy future is largely determined by the assumptions and expectations we have today. And because energy plays such a critical role in the health of our economy, environment, and people, the importance of getting it right on energy can’t be overstated. It’s for this reason that we encourage everyone—citizens, policymakers, and the media—to not take the EIA’s rosy projections at face value but rather to drill deeper. > Before It’s News: What About Innovating Beyond The Growth Trap? A Challenge To The Ecofiscal Commission’s Growth Fixation (James Magnus-Johnston). It’s not necessarily true anymore that economic growth increases our incomes and always transforms our lives for the better. Today, some features of economic growth are increasing the incomes of the richest, stagnating the incomes of the poorest, and depleting the innovative spirit of the economy. Who has the time to worry about climate change and mass extinction when they’re just getting by. > End Of The American Dream: If The American Dream Is To Own A Home, Then It Hasn’t Been In Worse Shape Since 1967 (Michael Snyder). The percentage of Americans owning homes is widely considered to be a key indicator of middle-class health. During the second quarter of 2015 that number dropped from 63.7 percent to 63.4 percent. This shows that the percentage of Americans qualifying for mortgages has been falling dramatically. Never before has the rate of homeownership fallen so far or so fast in the U.S. The bottom line is that the middle class is dying. > Resilience:The Aquaponics Solution (Michael T. Mageau, Baylor Radtke, Jake Fazendin, Tony Ledin). Our current industrial food system is environmentally and socially unsustainable. The rise of local, sustainable food systems presents solutions to many of these environmental and social problems, but most are unable to provide consistent supply on an annual basis. Aquaponics holds the promise of solving this fundamental annual supply problem while requiring far less land, water, energy, fertilizer, pesticide, and herbicide inputs than conventional farming. > Food Tank: Fighting For Social, Economic, And Environmental Justice In Minnesota (Interview: Hilary Otey Wold, Executive Director of the Minnesota Food Association). MFA operates a number programs and initiatives that build a more sustainable food system based on social, economic, and environmental justice. They seek to impact local food production, grow more sustainable food producers, and enhance their connections to markets and resources within the St. Croix River Valley and the Twin Cities Metro Area of Minnesota. > MPR: Minnesota Rain Garden Go Big To Fight Pollution, Reuse Water (Elizabeth Dunbar). Instead of traditional gutters and catch basins, the Inver Grove Heights development has cuts in the curb for storm-water to flow into rain gardens where plants soak it up. Part of the massive Target parking lot and some road intersections are porous, allowing water to seep into the ground. For bigger storms, low-lying basins collect the excess and prevent flooding. It’s as if the whole area is one giant rain garden spanning more than 3,000 acres because when it rains, all the water stays on site. There are no underground pipes to carry it away to the Mississippi River. > New York Times-Star Tribune: Obama To Unveil Tough New Plan To Fight Climate Change (Coral Davenport & Gardiner Harris). In the strongest U.S. action ever taken to combat climate change, President Obama has unveiled a set of environmental regulations devised to sharply cut planet-warming greenhouse gas emissions from the nation’s power plants and ultimately transform America’s electricity industry. While opponents of the rules have estimated that compliance will cost billions of dollars, raise residential electricity rates and slow the U.S. economy, the administration argues that the rules will save the average U.S. family $85 annually in electricity costs and bring additional health benefits by reducing emissions of pollutants that cause asthma and lung disease. > Simplicity Collective: Low-Tech Living as a ‘Demand-Side’ Response to Climate Change and Peak Oil (Samuel Alexander). The most pernicious consequence of blind faith in technology (techno-fetishism) is that it deflects attention away from the need to rethink lifestyles, economic structures, or systems of governance. Regrettably, it is often considered an affront to human ingenuity to think that we cannot solve all problems with advanced levels of technological innovation and application. As a means to an end, technologies need to be assessed according to the ends served, and not merely the often-dazzling means used.